The last post I made on this website was a little over three years ago. Some of it, I have publicised on the Payne & Redemption Facebook Fan Page, but most of it, I have made the decision to keep to myself until further notice. I’ve been itching to let you guys in on so much more! But experience has taught me the harsh reality of counting your chickens before they are hatched. I released the first 1080p screencap from a sample clip I received from the very same Production House I would later hire to transfer the film’s HDCAM-SR tapes to hard-drive. I announced the transfer of the film’s HDCAM-SR tapes to hard-drive, allowing us access to the 1080p master footage for the first time, since 2006, in a file-based format — the biggest hurdle cleared in the history of the production. I released the second 1080p screencap from the film’s HDCAM-SR transfers. Patrick Streutjens from PayneReactor released his 3rd interview with me, entitled “PAYNE & DEDICATION”. I released the first photographic comparison, between the Standard Definition footage we used to edit the original trailers, with that of the new 1080p footage. I followed up my previous post with another set of comparison photos, further outlining why it was necessary to have the HDCAM-SR tapes transferred to a file-based format. I announced the release of the first ever remastered trailer to Payne & Redemption, in 1080p, edited directly from the film’s HDCAM-SR transfers. I announced that I had completed the fifth draft to the screenplay that will serve as our blueprint to accompany the footage we shot back in 2006. 2019 is a new year, and another 365 days rife with potential. Q: Will we see more updates on Payne & Redemption over the next year? A: YES! And as before, whilst I won’t divulge every little detail, I will keep you guys informed on most of the updates that are set in stone; on this website, the Payne & Redemption Facebook Fan Page, as well as on my Twitter account. Q: Will Payne & Redemption ever see the light of day? A: OF COURSE! Payne & Redemption has been a very long, arduous, expensive, and emotional roller-coaster for me, as well as for those around me. But what many forget, is that P&R is a passion project of mine — not a job I am paid to do — and therefore has to be juggled around life’s priorities and responsibilities. In closing; to every one of you guys who still believes in this project, I cannot express how much gratitude I have for your unwavering support, not to mention how patient you have been and continue to be! It says a lot about your character, and I am proud to have you along with me on this journey. The future of Payne & Redemption may not yet be set, but work on the production has never stopped, it will never falter, and it will continue into the night until it is ready to be released; when it’s done. So, instead of me blabbering on about it on this blog, follow my Twitter feed, as well as the Payne & Redemption Facebook page, and get the scoop on all the latest — exclusive — news and media surrounding the production! Plus, as always, if you have any questions regarding the film, I’ll endeavour to answer them for you. Although a ways until completion, I’m proud to announce that Payne & Redemption is now featured on RED.com, under the “Shot on RED” category of RED Digital Cinema’s website. I feel extremely honoured to be part of the RED revolution and for Payne & Redemption to be included in their filmography, amongst many of Hollywood’s top billing titles as well as successful independent ventures. Oh, and speaking of RED, we’re actually ditching our RED Scarlet camera and going with the Epic-MX. That’s right, boys and girls — We’re joining the big leagues. Payne & Redemption will be shot on RED’s elite, and nothing less. OK, so it’s not quite the newly announced Epic Dragon, but if it’s good enough for Peter Jackson, it’s good enough for me! I just won’t be shooting it at 48fps, with a shutter speed of 1/96th of a second. Love ya, Pete! I know a lot of you are thinking that all it sounds like these days is “we need this, we need that; I’ve got this, I’ve got that”, but these are the steps we need to take to go the distance — these are the battles we need to fight to get to where we want this project to go. This isn’t some YouTube video shot with a bunch of friends on an iPhone or a DSLR, and I’m not dissing those films that are. But you have to remember, Payne & Redemption is a professional grade motion picture with professional — as well as amateur — cast and crew, and as a result, needs to be approached in the same way professional films are. We’re just doing it on a much, MUCH lower budget, and because of this, have to endure the many associated pitfalls. We’ve come a long way since 2006, when we knew relatively nothing about the film industry or film-making, and during this time, we have made many mistakes. But we have always learned from those mistakes, pushed forward, and made sure we’ve come out on top. Any time we’ve been backed into a corner, we have stood tall and fought for what we believe in, and will continue to do this until we no longer need to. Sure, it’s been quiet on the P&R front over the past 5 months, but plenty of work is afoot behind the scenes; including the writing and re-writing of treatments, test footage planning, location scouting, prop gathering, and much more, all of which costs time and money, and neither of which I have much of to put into a project that isn’t currently generating a return, so things have to be tackled as and when. Perhaps one of the more important aspects many people neglect to recognize is “LIVING”, as without that single element, there would be no production at all. So, occasionally, Payne & Redemption has to be put on the backburner in order to allow me to concentrate on other aspects of my life, but by no means is it ever overlooked or forgotten. The enthusiasm and inspiration is and always will be there — we just have to find the right time(s) to apply it. Roger Williams, the original Storyboard Artist for Payne & Redemption, who famously dropped out from the project after re-reading the script and deeming it “sick and perverted”, passed away on May 2nd, 2013, at the age of 71. A true artist with an attention to finite detail and perfection; Roger’s career included working with “Oliver!” set designer Sean Kenny on various theatrical productions, as well as Expo ’67, and for the BBC on numerous television and stage productions, including Dixon of Dock Green, not to mention alongside Ridley Scott on many of Ridley’s earlier endeavours. Roger Williams will be remembered by many. September 15th, 1941 – May 2nd, 2013. Back when I first considered Kickstarter, the company was only accepting projects from individuals who had, or had access to, US based bank accounts. Whilst my Associate Producer, Dewi Morgan — who lives in the US — was willing to help me out, it just never happened. Since October 10th, 2012, Kickstarter have been accepting projects from individuals who have UK based bank accounts, so it is at least now a more viable consideration. However, at this time of writing, I have orchestrated four fundraising campaigns for Payne & Redemption (one Fundable, two IndieGoGo, and one on the P&R website), and have raised less than £300 in total. We need one helluva lot more than that to get this project rolling. I am a little dubious about starting a Kickstarter fundraising campaign because of the lack of success with previous fundraisers, but am not against the idea, and as the old saying goes, nothing ventured, nothing gained. I do, however, believe we need more material to show potential investors, as when you keep re-hashing the same stuff from six years ago, people become suspicious, and rightfully so. I certainly wouldn’t want to give someone my money for something I didn’t totally believe in! While I’m not able to show any more material from the footage we shot back in 2006 — due to it being captured on a format that I can’t access without having a spare £2,000 floating around — I’m now able (well, almost) to shoot test footage, or a sort of Payne & Redemption inspired “demo-reel”, with the original cast. This is what I plan to do before starting another fundraising campaign, to show everyone that Payne & Redemption is still very much alive and kicking, and most importantly, progressing. 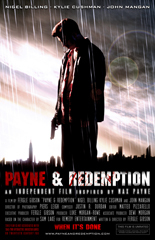 Copyright © 2005-2013 Payne & Redemption - An Independent Film. All Rights Reserved. This film is NOT associated with Take-Two Interactive, Rockstar Games or Twentieth Century Fox. 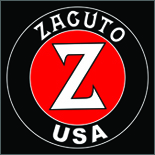 Website design by Visual Fizzle.